On Wednesday 21st November we will be launching our latest research report ‘Parliaments and the People: How digital technologies are shaping democratic information flow in Sub-Saharan Africa’. This report presents the findings from an extensive and in-depth research study into digital democracy across Nigeria, Kenya, South Africa and Uganda. This research explores the use of digital channels and platforms in communicating political information in the region, and considers the implications for future development in digital and institution-building. The report analyses the breadth of digital political engagement in the countries studied, and identifies key structural and cultural considerations that influence whether digital solutions to improving democratic engagement, transparency and accountability in governing institutions will be successful. The findings of this report are more relevant than ever to those interested and involved in international development and institution-building, through which policy implementations digital solutions are being increasingly embedded. The full report will be published here on our news feed, via Amazon Kindle, and on our social media feed at 4pm on the 21st November to coincide with a launch event for the report at the House of Lords. That event is now fully subscribed, but please follow along on Twitter #ParliamentsandPeople and @mysociety to share the report and join the conversation. Sign up below to hear when this report is published. On 21st November we will host a seminar at the House of Lords exploring how digital tools are being used in Sub-Saharan Africa to bring parliaments and citizens closer together. During the seminar, we will be launching our Parliaments and the People: Digital Democracy in Sub-Saharan Africa report, which presents the findings from an extensive and in-depth research study into digital democracy across Nigeria, Kenya, South Africa and Uganda. This research explores the use of digital channels and platforms in communicating political information in the region, and considers the implications for future development in digital and institution-building. The seminar will bring together researchers, policy makers and practitioners to discuss how the insights from this and other work can be integrated into policy, engagement and future development work. Two further speakers will be announced soon. Date/time: 21st November 4pm – 6pm. As capacity is limited, attendance to the event is by invitation only. If you’re interested in attending please email to request an invite and we’ll let you know full details. Since 2015, mySociety have collected and shared open data on the world’s politicians via the EveryPolitician project. And while we receive emails from across the world pretty much on a weekly basis, asking us to update a dataset, we still can’t say exactly who uses the EveryPolitician data, and for what purpose. This is largely because we want to place as few barriers as possible to using the data. Asking folk to fill in a form or register with us before they access data which we believe ought to be free and accessible? Well, that would be counter to the whole concept of Open Data. But that said, it’s really useful for us to hear how the data is being put to use, so we were very pleased when Global Witness sent us their report, The Companies we Keep. This fascinating read shares the results of their analysis of the UK’s Persons of Significant Control Register (PSC) in which Global Witness used EveryPolitician data to see if there are politicians who are also beneficial owners of a company registered to the UK. The red flagging tool can be used to uncover higher risk entries, which do not indicate any wrongdoing but could be in need of further investigation… such as the 390 companies that have company officers or beneficial owners who are politicians elected to national legislatures, either in the UK or in another country. The report also highlights some of the challenges faced by Companies House that prevent the register from fulfilling its full potential to help in fighting crime and corruption. We recommend a full read: you’ll find it here. It is very helpful for us to demonstrate the uses of EveryPolitician data, both for our own research purposes and to enable us to secure the funding that allows us to go on providing this sort of service. If you have or know of more examples of the data being used, please get in touch with me, Georgie. And if you value open, structured data on currently elected politicians, you should get involved with the Democratic Commons; this is a developing a community of individuals and organisations working to make information on every politician in the world freely available to all, through the collaborative database Wikidata. 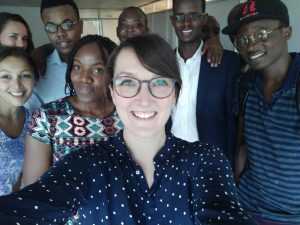 Our recent research interests have taken myself and mySociety’s Head of Research Rebecca to four Sub-Saharan countries over the last two months, where we’ve spoken to 65 individuals from 45 fascinating organisations. Our aim with this research is to investigate how political information around legislatures and government is produced and consumed in Sub-Saharan Africa. This information is of course particularly important for us to know as a lot of our work is helping organisations set up digital solutions to allow citizens to connect to their representatives and monitor/ask what they’re doing, as well as trying to simplify and display complex political information. Through this research we want to better understand political landscapes in the countries we work in to make sure the digital solutions we provide are actually of use. We hope the research will inform us, and others, about what does and doesn’t work when creating parliamentary monitoring and Right To Information websites and other Civic Technology solutions. We’re aiming to publish the full research report at the end of this year, but read on to hear about the research process, who we met along the way and some interesting highlights. 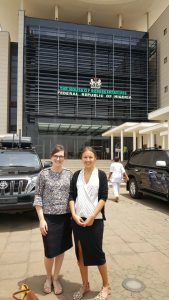 So back in March Rebecca and I headed off to Abuja in Nigeria to commence the project. With help from our friends at EnoughisEnough Nigeria (EiE) (who we’ve worked with on ShineYourEye) and through our existing contacts with the MacArthur Foundation’s On Nigeria programme we were lucky enough to meet with 20 individuals from a variety of different organisations. We met and interviewed representatives from: the Centre for Information Technology and Development (CITAD), The Public and Private Development Centre (PPDC), The Freedom for Life Initiative, BudgIT, Women’s Advocates Research and Documentation Centre (WARDC), Shehu Musa Yar’Adua Foundation, Right To Know Nigeria (R2K), Premium Times Centre for Investigative Journalism (PTCIJ) and Connected Development (CODE). A particular highlight was meeting one of the members of the Nigerian House of Representatives at the National Assembly building, which for us politics nerds was very exciting (see said nerds here to the left)! From Abuja off we went to Kampala, Uganda. 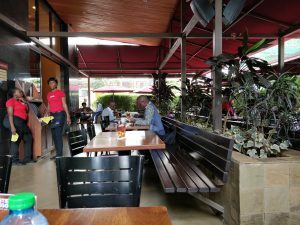 This time our friends at The Africa Freedom of Information Centre (AFIC) generously helped us set up interviews with NGOs and media organisations. We work with AFIC on FOI request site AskYourGov (which uses our Alaveteli software). We interviewed representatives from: Parliament Watch, Galaxy FM, Collaboration on International ICT Policy for East and Southern Africa (CIPESA), New Vision and HiveCoLab. One of the most interesting highlights was the discovery of the prevalence of WhatsApp Twitter Facebook (also known as WTF), or Snapchat WhatsApp Instagram Facebook Twitter (SWIFT) data bundles. These only allow users access to these social media channels, and don’t allow web browsing. These data bundles can be purchased for as little as £1 per month, and this is primarily the way that normal citizens experience the internet. Obviously this is highly relevant when we think about our partners’ sites, which might not be accessible to as wide an audience as intended. A quick selfie during the fireside chat we did at HiveCoLab, Kampala. After a brief interlude which included organising and hosting our annual research conference TICTeC (phew! ), we were back on the road again. This time to Nairobi. We were lucky enough to have very interesting conversations with representatives from the following organisations: Kictanet, iHub, Sovereign Oversight, World Wide Web Foundation, Africa’s Voice Foundation, International Budget Partnership (IBP), National Democratic Institute (NDI), Mzalendo Trust, Katiba Institute, Local Development Research Institute (LDRI), The Elephant and The Institute for Social Accountability (TISA). A particular highlight was speaking to one of the lawyers who wrote Kenya’s 2010 constitution (again, hugely exciting for politics geeks!). And who knew that the maximum number of participants in a WhatsApp group is 256? Not us, but everyone we spoke to did! WhatsApp is a huge vector of information in Kenya, including news content and political discussions. 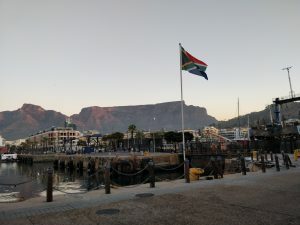 Our final destination was Cape Town in South Africa. Our amazing partners at Parliamentary Monitoring Group (PMG) very generously arranged a great mixture of interviews for us and even took us on a tour of the South African parliament. During our time in Cape Town we interviewed: a parliamentary researcher, journalists from The Daily Maverick, the Goedgedacht Forum, My Vote Counts, PMG, Open Democracy Advice Centre (ODAC), the Land and Accountability Research Centre (LARC), OpenUp, Black Sash, Congress of South African Trade Unions (COSATU), Dullah Omar Institute and Council for the Advancement of the South African Constitution (CASAC). A few of the most interesting things we discovered: mobile data is super expensive in South Africa; the proportional party list system to select representatives makes it difficult to hold politicians to account; and Twitter, Facebook and WhatsApp are not used anywhere near as much as they are in the rest of the African countries we’ve looked at. We are incredibly grateful to all of the above organisations for helping us with this field work, we really appreciate you taking the time to talk to us and helping us with arrangements. So now we’re back at our desks the real work putting the report together begins. If you have any recommendations of who else Rebecca and I should talk to as part of this research then please do get in touch. We look forward to sharing our full research findings in our report at the end of the year! Does publishing a correspondence with MPs make it more likely that promises will be upheld, and citizens’ voices heard? Thanks to a piece of software we’ve just installed on a partners’ site, we may be about to find out. As you may know, mySociety supports several partners’ projects worldwide: one of these is People’s Assembly, which, like our own TheyWorkForYou, makes it easier for citizens to find out who their representatives are and what they’re doing in Parliament. PMG, who run the site, saw the potential of the Open Source WriteInPublic software, which was made by our friends in Chile Fundación Ciudadano Inteligente. Like mySociety’s own UK tool WriteToThem, WriteInPublic allows users to easily contact their representatives; where it differs is that the whole correspondence is published online. It’s a way of holding representatives to account, and making sure that promises or assertions are not forgotten. 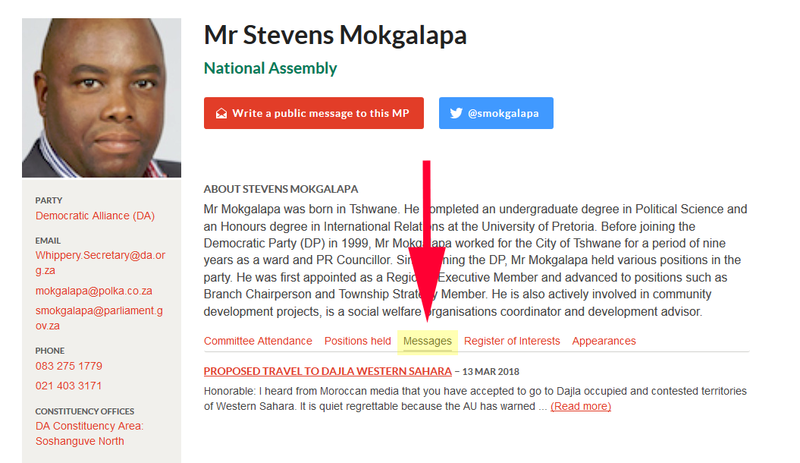 Here in the UK, of course, MPs only deal with correspondence from their own constituents, but in South Africa, citizens may legitimately write to any MP. Messages are far more frequently about policy rather than personal issues, which might go some way to explaining why a WriteInPublic tool targeting MPs is a more viable prospect than it might be, say, in the UK. PMG are yet to promote the tool through their newsletter and social media channels, but of course, users are discovering it for themselves on the homepage. In the five weeks since launch, more than 270 messages have been sent to MPs. These can be seen on the MPs’ pages, in a new ‘messages’ tab: here’s an example. 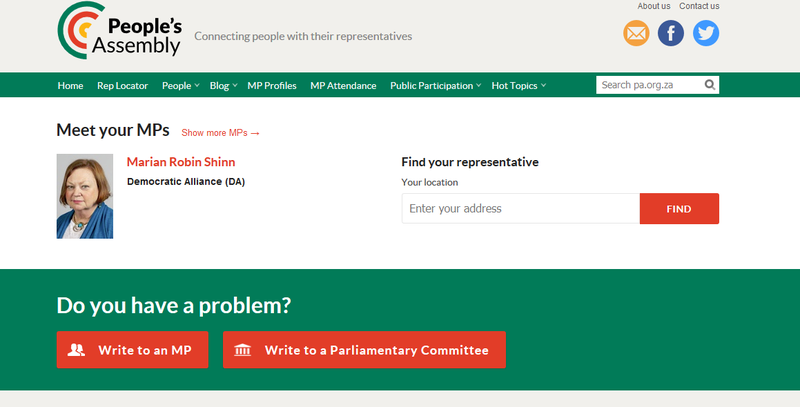 The new tool doesn’t just invite users to write to their MPs directly; People’s Assembly now sports two invitations on its homepage: one to write to an MP, and another to contact a Committee. PMG have previously had some success in surveying their users over key issues of party funding: the survey results were sent to a sitting Committee, and the chairman reported that they were “very helpful for the Committee’s discussions” and were “used as a reference point to gauge public opinion especially where discussions were deadlocked”. The group are keen to extend this kind of engagement, and this second tool allows citizens to send a message to a Committee dealing with specific issues such as public works or the police. PMG are planning to continue surveying their users, while also pointing them at the tool as a way of getting public input into the bill-making process. In the spirit of Democratic Commons, the underlying contact data for the MPs tool (though not the Committees one) is also now being used by Wikidata and our EveryPolitician project, so it’s freely available for anyone to use. For us it’s a win-win when data can not only serve an immediate purpose, but will also go on to provide a resource for anyone else who needs it. The latest installation of our Alaveteli software, OPRAmachine, is an interesting new use of the platform. Rather than covering a whole country, as most of the other Alaveteli installations around the world do, it services just a single US state. OPRAmachine, which launched in October, allows citizens to request information from state and local governmental agencies in New Jersey, under the Open Public Records Act (OPRA). Why did you decide to set up OPRAmachine? I developed an interest in New Jersey’s Freedom of Information law in the course of my work as an independent journalist. I created OPRAmachine because there is a void in our state for a statewide Freedom of Information portal. Historically, New Jersey has gained a reputation as a state with excessive spending on state and local government, along with an enduring “culture” of political corruption, as defined by The New York Times. I have found that in all too many cases, a lack of transparency and compliance with OPRA disclosure requirements has gone hand in hand with instances of government mismanagement and corruption at the state and local level, some of which have been publicised over the years. While working in my capacity as an independent journalist, I began making extensive use of the OPRA law in order to study the activities of local governments in New Jersey. I became very familiar with the process and the how the law is effective at bringing about vitally needed transparency through the right it gives citizens to obtain public records. A year ago, we helped Belgian group Anticor launch the Alaveteli site for Belgium, Transparencia.be, and so far it’s been an incredible success. Since launch, the site’s had almost 60,000 visitors and over 375,000 page views— that’s unusually high for an FOI site in its infancy — and they’ve even brought about a change in local FOI law. So how exactly have Anticor achieved so much in such a short time? We chatted to Claude, a key member of the Transparencia team, to learn more, and the first thing we discovered was that the stellar visitor numbers were actually news to him. That might give us a clue as to one factor in their success: they’ve been far too busy to check their site analytics! Code for Croatia are one of many groups around the world who have used our software Alaveteli to set up a Freedom of Information site — ImamoPravoZnati (“We have the right to know”) was launched in 2015 and has processed more than 4,000 requests. Many organisations might count that a success and leave it there, but Code for Croatia are clearly a little more ambitious. We’ve been interested to hear about their two latest projects. The Alaveteli code was written to send FOI requests to public authorities. But in essence, it’s little more than a system for sending emails to a predetermined list of recipients, and publishing the whole thread of correspondence online. Change that list of recipients, and you can create a whole new type of site. Reklamacije (“Complaints”) puts the process of making consumer complaints online. It’s early days as yet — the site’s still in the beta phase, during which testers are putting it through its paces. There have been messages about bank closures, insurance policies… and even the inconsistent quality of the quesadillas at a Mexican food chain. As we’ve often mentioned here on this blog, our FixMyStreet codebase has been put to many different purposes that require map-based reporting, but as far as we’re aware this is the first non-FOI use of Alaveteli so we’ll be watching with interest. Perhaps it might give you ideas about setting up a similar service elsewhere? Code for Croatia have also launched a campaign asking users to request details of ministers’ travel expenses. If that sounds familiar, you’ll be remembering that back in January, AccessInfo did much the same with EU Commissioners and their expenses on the European Union FOI site AskTheEU. We can tentatively say that they were successful, too: it’s been announced that the EU expenses will be proactively published every two months. AskTheEU say they welcome the move ‘cautiously’, so let’s see how it all pans out. The key to both these campaigns is pre-filled requests that make it really simple for supporters to make a request to a specific politician, while ensuring that the requests aren’t duplicated. That’s something that Gemma explained how to do in this blog post — it’s a massive benefit of the friendly global Alaveteli community that we can all share insights like this, and especially that other groups can try out initiatives that have proved successful.